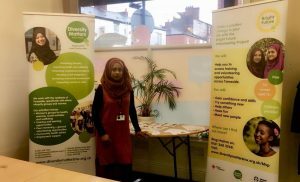 Months into a 3-year programme, the Bright Future Volunteering Project is smashing targets and empowering women from ethnic minorities across Tameside. Since June 2018, 80 volunteers have joined the new project which gives teen girls (15+) and women in Tameside the opportunity to take up meaningful volunteering opportunities in places like nurseries, schools, shops, community groups and at Diversity Matters North West, where some have taken the lead for social activities and begun volunteering as peer mentors. The programme also includes Taster Days in places such as hospitals, gyms, training organisations, charities and Citizens Advice, where the volunteers are given the chance to get a feel for the places, both with a view to place them as volunteers, but also with the mutually beneficial purpose of making them better acquainted with the services in the Tameside area. As the project has evolved, two popular weekly sports club meetings have been added to the lengthy activity list. Working in partnership with Action Together, Active Tameside and Jigsaw, Diversity Matters North West’s project lead, Hasina Khanom, has managed to bring in a very diverse set of women from multiple backgrounds including Eastern Europe, parts of Africa, the Middle East and Asia. The ladies travel happily from Dukinfield, Stalybridge, Hyde, Ashton and even Denton to join in the activities, because the project offers something a little different, that makes a real difference to the lives of the women. The Bright Future Volunteering Project is a free programme available for women from ethnic minority backgrounds aged 15+ living in Tameside. For more details or to be put on a waiting list to join the project, please ring Hasina on 0161 368 3268.